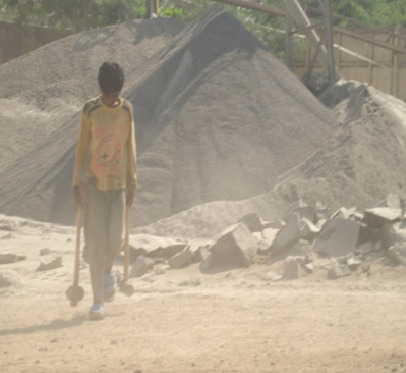 Quarrying for construction material , minerals or to make gravel is hard and dangerous work, particularly for children. But for many poor youngsters whose families are involved in this activity, there is no other choice. Family earnings from quarrying may be barely sufficient to cover basic needs and money earned by children can be an important part of a household�s income. It may even mean the difference between eating and not eating on a given day. 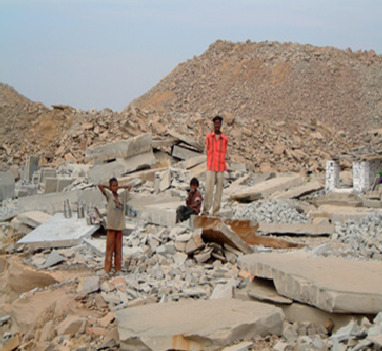 Work in stone quarries is hazardous labour � children carry loads far too heavy for their body size; they risk accidents from the use of explosives and they are constantly exposed to fine dust that can cause chronic respiratory infections, notably silicosis. They may be injured by flying shards of rock that can cause severe eye injury, develop skin problems resulting from prolonged periods working in intense sun and heat, and suffer dehydration. While the hazards and processes are fairly similar from country to country, the family situations, working conditions, ages and gender of children involved vary according to local traditions, the level of poverty, the regulatory environment or other employment or schooling alternatives.